A couple riders (Oren and Anne) in the E. Lansing, MI/USA event (2009) sharing the silence (photo by Tim Potter, E. Lansing organizer). Many more photos & videos from the 2009 events can be viewed by using our Event Report tool. We've recently - sadly been informed by our Danbury CT USA Ride of Silence organizer, that former Ride of Silence organizer Thomas Steinhert-Threlkeld of Weston CT was killed last Oct. while cycling, the 1st known death by a motorist of an RofS organizer. Thomas had previously organized a RofS in Weston, Farifield & Westport CT, from 2007 thru 2012. The Danbury CT RofS will pay a special tribute to Tom this year. The RoS board requests that all event organizers recognize Tom for his efforts over the years to remember and honor others and to raise awareness of all our rights to ride safely on our roads around the world. His widow, Kayte, would like to add: "Tom logged. 160,000 miles on his bikes over 20 years, including a ride across America with Larry Schwartz (the man in who's memory the Ride of Silence was started by Chris Phelan). There are many photos on his Facebook page and at www.edgeoftheroad.com I will be at the Danbury, CT ride with the Hat City Cyclists." Letter of endorsement/ support from the Senator of Rhode Island. This is a good example of a support letter for other organizers to consider. The official 2011 Ride of Silence poster for events anywhere on the globe is here for downloading and localizing (courtesy of our Hong Kong organizer, Martin Turner and Kong of Kongnection Graphics Limited). Print instructions are here and one more file referenced in the instructions is here. A small group of RoS organizers and supporters met on Wed. (Mar. 9) evening during the Natl. Bike Summit in Wash. DC (Mar. 7 - 11). Here's some pics from our gathering. Consider getting together with your fellow RoS organizers in your state/ region to share ideas, encourage each other, etc. Jeff Stephens, our Columbus, OH organizer since 2006, (who attended our RoS gathering noted above) was featured in the League of American Bicyclists' blog about his delegation's successful lobbying action during the Natl. Bike Summit. The Ride of Silence Midwest Organizer Camp was held in Arlington Hts., IL, on Jan. 15, 2011 with 13 organizers from around the midwest. It was a great opportunity to meet some fellow RoS organizers and share ideas. Meeting notes are here (Word format file). Here are some pics from the event; and here's segment 1 & segment 2 of the video archives from the event if you'd like to watch some of the action. Join other RoS organizers and supporters on Facebook here. Subscribe to the RoS Organizers Google Group to share ideas, ask questions, etc. Please send links to national/ regional news articles, video, etc. related to the Ride of Silence to be considered for this page to the webmaster. Official Ride of Silence on Facebook - communicate with other supporters and organizers. Drawing on experience: A graphic artist, wilomis, draws the events around his bicycle accident & highlights Philadelphia's Ride of Silence event - see part 1 & part 2; 6/15/10. Road bicycling: Too dangerous? Excellent video report on CNN Living site, May 27, 2010. Yehuda Moon comic strip features Ride of Silence theme, May 19th, 2010. A bunch of intriguing comments to this strip. Congressman Blumenauer Demands Attention to Bike Fatalities on CSPAN- highlights Ride of Silence, May 18, 2010 (YouTube video). News article, "Annual ride set to recognize killed biker" by RoS founder Chris Phelan in White Rock Lake Weekly, May 14, 2010 issue. RoS large banners with messages design - 2 different sizes with RoS inspired messages were designed to be mounted to large boards mounted to bike-trailers, adapted from a base design by Jean Gorman by Tim Potter, E. Lansing, MI organizer. A new banner ad (animated GIF format) has been created by our very talented volunteer graphic artist, Mark Kamenish (creator of previous year's posters) which can be used on your web sites and other web sites to help promote the event this year. Our Arlington Hts. IL organizer, Gary Gilbert, has an excellent blog post on May 12th that's tracking news articles re: fatal accidents in the USA just since May 1 (18 and counting). Pace of Chicago (Endurance sports blog) article highlights Ride of Silence events in IL. Check out Brasilia- DF's event poster. Check out Hong Kong's promo poster for the 2010 event; great work and inspiration. The League of American Bicyclist's web site features a new plug for the Ride of Silence Worldwide events (4/18/10). Thank you LAB! Here's a direct link to the article. "Ghost bikes honor the fallen" article about the Ghost bike movement and Ride of Silence from "ModeShift", a monthly newsletter of the Active Transportation Alliance (Vol. 3 Issue 3, April 2010). Reports from the Michigan Bike Summit and our first Ride of Silence organizer dinner meeting (March 26, 27, 2010). We've just received a powerful endorsement by Congressman Earl Blumenauer, 3rd District, Oregon, one of the two most famous bicycling congressmen in Washington, DC. Read his "Be Bike Partisan" page on his web site to get a better idea of what Earl has done and is continuning to do on behalf of bicyclists in the USA (Mar. 24, 2010). NEW! Donate to the Ride of Silence and help support the efforts and growing expenses related to our mission. For more information on donating see this page. Ride of Silence Cause page on Facebook - become a member and help promote our mission. We've exceeded 1500 members (as of 4/18/10)! Ride of Silence Song (mp3 file, 4.5 mb), singer and music composer Luis Gomez (España), adapted with permission from the lyrics of the official poem of the Ride of Silence by Mike Murgas (USA). YouTube version of song here | High-quality MPEG-2 file here. 2010 International Promotion Brochure - easily customize this new brochure template to help promote your 2010 event. TV news interview re: RoS with Michigan organizer, Dave Duffield, 9/23/09, (scroll past the first interviewee about ½ way through). 8 (Arizona) students help to create memorial to bicyclists. Arizona Daily Star, 8/17/09. Iowa DOT newsletter, 7/09, Ride of Silence article (pg. 16). More than 100 riders took part in the 2009 Ride of Silence in Ames May 20 to honor the memory of DOTer Mark Snopek was killed Aug. 8, 2007. 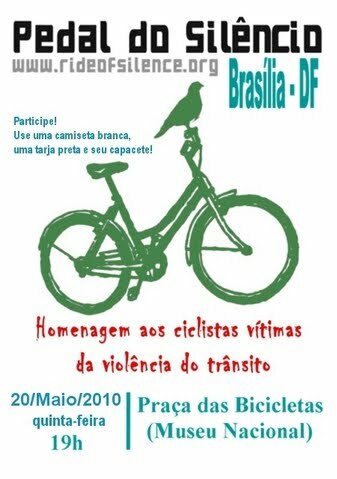 Ride of Silence logos in other languages on the Organizer Resources page. Memoriam info. on a Google map here. Memoriam Powerpoint slideshow - for pre or post-event viewings.